Last week I walked past the shed that holds the vegetables and caught an unusual aroma in the air. And upon investigation I found one of the most overwhelming, overpowering, nose wrinkling stink ever. Ooh, something has turned, I thought first. I made mention of this to James as he walked past and he laughed, and said, "look inside and see if you can find the offending agent." He stood behind me and snickered as I opened the door. The smell that hit me is comparable to opening up a cryovac bag of chicken that has been sitting in the trunk of your car, parked in the Arizona summer for a few days. No, that's wrong. Tha the trunk of a car in an arizona summer would probably cook the meat, but you get the idea. Offensive to say the least. And then I saw it, a hedgehog of a fruit sitting on the shelf. Only something that looks this strange could possibly be giving off that kind of offensive odor. So what is it? 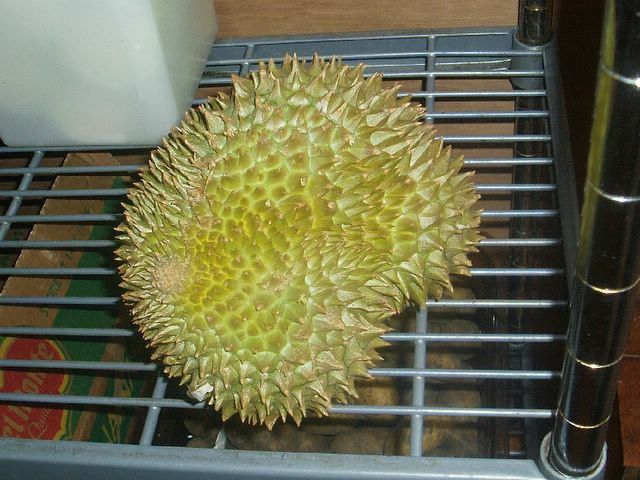 It's a Durian fruit. This fruit is considered the king of fruits in malasyia and thiland. It consists of this thorned shell with 5 pods of fleshy fruit and large seeds that resebmle the segments of an orange. the flesh is white in the same manner a banana is white. And the fleshy fruit has a firm creamy quality when pulled out of the pod. The mace like quality of this fruit is actually responsible for more than a few deaths a year as the trees grow to be over 40 meters high. It is even advised that when checking for ripeness, you stand with your feet shoulder width apart to avoid any foot injury. 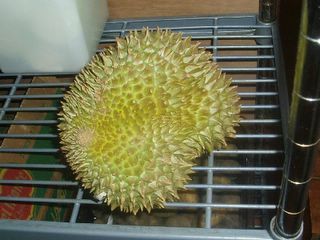 A ripe durian is checked by holding the stem as a handle, and looking closely for holes. There are 3 holes that indicate it's desirability. First is a worm hole. this will indicate the presense of worms and should warm you to put the fruit down and move on. Second is a man made conical hole. This should also let you know to reject the fruit. The previous durian lover has taken a peek inside and deemed this fruit inedible, so take the lead and move on. Third is a squirrel hole. This means that a squirrels sharp nose has found a good fruit and the creature has had a little snack allready. So if it's good enough for a squirrel, then it's good enough for you. You don't mind sharing with the cute little bushy tails do you? Just make sure you don't have to pay full price. Then you are meant to shake the fruit. This is where the danger of a foot injury is large. And finally, take a big whiff.... if you don't pass out, it's not over ripe. If you can handle the smell, it's not ripe at all. There are even parts of the world that have outlawed public sales and eating of this fruit as it offends everyone within a 100 yard radius. Restaurants that use this fruit often have to prep it at night after all the customers have left and the kitchen has time to air out before they come back. But the odor is all in the skin I was told. The fruit is sweet and pleasant, like a banana. So i tried it, this alien banana. Second reaction......invoulintary ejection of the fruit from my mouth into the cup of water I had ready. Third reaction......try again. This time I forced myself to controll the first impulses. I defined what I didn't like, moved on, and yes, somewhere in there was the same sweet quality of a banana. It was just mixed in with this rotting onion flavor. Sound good??? Heston helped me to define what it was that I was reacting so poorly to. The Durian shares the same sulfer compounds that onions and garlic carry. Mixed with it's very ripe state, this sulfer totally overwhelmed me. But back there somewhere, was something nice and familiar, sweet and comforting. And I can see how this fruit could lend itself to various other foods. Russell hates onions, and makes this squinty eyed, tight lipped, scrunched up face when he even has to think about one entering his mouth. I cleverly call it his onion face. Once I saw the onion face from across the grocery store. I had almost convinced him that a shallot was not an onion, but garlic. I even got one in the cart untill I saw that onion face looking at me with a finger pointing to the little price sign that said , "shallot onions, 99 cents". The shallot didn't stay in the cart needless to say. Well, the durian fruit caused me to make an onion face, and still do at the memory of that experience. If onions taste like that to him, I think I finally understand. I think durian tastes like custard eaten in a garbage dump. When I was in Sri Lanka, we drove around for days with one in our van. It stunk like crazy, but was oh so delicious when we ate it! I saw one of the trees that when the fruit is ripening, the owner will post an armed guard 24/7 to watch over it. They're like hanging gold! I'm a Singaporean fan of your blog-- if you have the opportunity to, tasting durian when it's chilled, whether in a cream puff or as a cake filling, is often more palatable as the edge is taken off somewhat. Here's to more food experiences!